Did you know that OSHA plays a very important role in nearly every restaurant and bar industry lawsuit and insurance claim? Well, it most certainly does, and it doesn’t matter if the person that got injured, harmed, sickened, maimed or killed was an employee or a customer of the subject establishment. As a practicing attorney trying to make a living doing what you do, do you even realize the incredible size of the restaurant industry, the special circumstances that pertain to restaurants and bars, and the legal opportunities abound? In this series of articles, we plan to help shine the light on the restaurant industry, the dangers that exist within them, and how nearly every law practice can benefit from taking on restaurant and bar industry law suits. The restaurant industry is special for so many reasons. The enormous size of its workforce and the age and diversity of the workers makes it highly unique and complex. Restaurants have an extraordinary economic impact in markets across the United States, and the social influence that our industry has on the American way of life rivals all others. The restaurant industry employs more than 14 million workers with roughly 2.5 million designated management or supervisory personnel. To put these numbers into perspective, this alone accounts for more than 10 percent of the entire US workforce, making the restaurant industry the second largest employee workforce behind the federal government. Further, it is worth noting that more than 50 percent of the entire US population has worked in the restaurant industry at some point during their working lives, and nearly 50 percent cite a restaurant industry job as their very first place of employment. Beyond that, let’s not lose sight of the extraordinary ancillary employment impact of the industry. Roughly 150,000 businesses nationwide provide various products and services to the restaurant industry, and those businesses employ millions of workers as well. Most of us have witnessed the wide variety of restaurants doing business across the country, but what many fail to realize is just how complex these establishments are to operate. Restaurants range from fast food to fine dining and from national chains to mom-and-pop operations. The industry’s owners, operators, managers, executives, support personnel, and hourly employees have a huge number of differing job functions, titles, roles, and responsibilities; and with those come a wide range of compensation and levels of training. Take a moment, if you will, to consider what needs to take place in a restaurant (any restaurant) to deliver a single meal to a family of four—not to mention all of the things that must take place to provide foods and beverages that are safe and fit for human consumption. Now do this several hundred, or even several thousand, times each and every day, each and every week, month after month, and year after year. Further, consider the operational and administrative responsibilities that must be met to operate a business (any business), let alone make it into a viable and profitable venture that provides a source of income for not just one family but, in most instances, for many. At the very least, those who are responsible for running a restaurant are accountable for day-to-day operations; human resources; employee oversight and training; purchasing; food and beverage preparation; handling and distribution; menu item management; a certain level of food manufacturing (depending on the type and style of food and beverage offerings provided); sales building; financial profit and loss management; accounting, tax, and legal oversight and compliance; local, state, and federal governing body oversight and compliance; and, of course, safety, health, and security oversight, training, and compliance. Many times, this plethora of job functions, roles, and responsibilities are taking place all under one roof and all within the confines of the four walls of the building (although, if truth is told, they frequently get carried over to the kitchen table at home). As if that’s not hard enough already, more often than not, these management functions are being completed by just one person (typically bearing the title of General Manager or owner) or by a very small handful of people, typically referred to as a management team. Corporate restaurant infrastructure is much different than that of independent restaurants and offers significant assistance on certain things as they pertain to these roles and responsibilities; but don’t kid yourself, it’s not all peaches and cream there, either. With restaurant chains also come all sorts of other responsibilities that we have yet to mention. Either way, the extraordinary number of jobs, roles, and responsibilities that need to be performed on a regular (mostly daily) basis to run just one single restaurant is what makes running a restaurant business so highly complex. Now place multiple restaurants under the authority and responsibility of a district or regional manager, and you have multiplied these complexities many times over. The same can be said as you widen the area of control and increase the responsibilities that fall under the larger footprint of a group of restaurants that are often spread far apart and, in some instances, cover the span of many miles or states. It stands to reason that adding distance between restaurant locations that one is trying to manage adds further complexities to the situation. Those who have never tried to operate and manage a successful restaurant (or group of restaurants) cannot even begin to comprehend what it takes. Those of us who have tried it and lived it (in many instances, lived it for many years) are well aware of the difficulties and complexities, as well as the other complications that often accompany each unique restaurant brand. We could go on and on about all the other things that make the restaurant industry complex; but, by now, you are probably getting a clear picture (or at least we hope so) of just how complicated it can be. 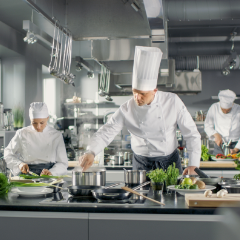 Because of this, the role that OSHA plays in the restaurant industry, and how restaurants operate and formulate their policies, practices, and procedures to be in compliance with OSHA, it is highly important, to say the least. Restaurant workers’ ages range from late-teens to elderly senior citizens. Each worker comes with a wide variety of training, education, skill, knowledge, and experience; and likewise, they each receive varying levels of income and benefits packages. Restaurant workers come from all over the world and speak many different languages. In many instances, several different languages are spoken during the same work shift in just one single restaurant location. Age, language, and comprehension are extremely important factors when it comes to OSHA compliance. There are many challenges that come with providing safety, health, and security training to young workers and complying with the laws that pertain to them specifically; workers on the opposite end of the spectrum present significant challenges as well. Even more challenging is providing training to those who struggle with the English language (or do not speak it at all). We will cover these issues more in-depth throughout this material. We have yet to mention the level of competition in the restaurant industry that takes place all across the country. Restaurants compete for sales, employees, locations, and marketing. Often, the incredible pressures placed on owners and operators, such as increasing minimum wage, lack of accessible commodities, constant price increases, inability to obtain credit, and constant threat of government intervention demanding even more compliance and regulation, make for extremely tight margins and few pennies of profit actually realized per plate. Sometimes, trying to earn a dollar in the restaurant industry is akin to trying to squeeze the juice out of a dried-up turnip. Yes, you read that correctly. We believe that restaurants are America’s most important industry. Please allow us to explain. The economic and social impact of restaurants on nearly every type, style, and size of marketplace across the country is virtually unrivaled by any other industry. In fact, there are only a very few industries that even come close to leaving such a mark on our communities as restaurants do. The restaurant industry consists of more than one million industry establishments, and restaurants drive well over $700 billion in annual sales—but it expands far beyond that. When a restaurant realizes a single dollar of sales, the community realizes between $2.50 and $3.50 of additional economic impact. Towns, communities, cities, and venues of various types and sizes across America work diligently to inspire, motivate, and fund the opening and operating of more eating and drinking establishments of various kinds because community leaders know that restaurants and bars and other eating and drinking establishments do wonders for a local economy. That translates to more jobs, more businesses and homes, and more reasons for people to get out and about to spend money—in turn, generating more tax dollars. The economic impact made by restaurants is not discriminatory, as it positively impacts us all—regardless of race, color, creed, sexual orientation, economic status, age, or any other factor, for that matter. There is no other industry that can boast such wide and all-inclusive economic impact to cities, towns, and markets across America as restaurants. In fact, let’s take it one step further; we can’t think of any other industry that affects nearly every single man, woman, and child—from nearly every walk of life and every nook and cranny of the country—like the restaurant industry. Indeed, there is no other country that relies on restaurants the way America does. We should take great pride in knowing that America is the epicenter of the restaurant industry with more types, styles, sizes, options, menu offerings, and price points than anywhere else. That’s not to say that there aren’t other places around the world that appreciate a wide variety of restaurant offerings, but nothing compares to the restaurants doing business across the US. Consider this: If we each take a moment and reflect back on our life, it is more than likely that most of us will realize that many of the most important happenings and celebrations of our lives have taken place in restaurants. The most important happenings of our lives take place in restaurants and bars—birthdays, weddings, anniversaries, family reunions, career milestones, school and athletic achievements, first dates, and so much more, are celebrated in restaurants—because restaurants are personal. There is no better way to bond and create relationships, learn life’s lessons, or enjoy idle chit-chat than to sit down at a table and “break bread” or “knock back a few cold ones” with those whom we care about the most. The internet’s got nothing on restaurants and bars. Restaurants and bars were the world’s first sites to social network. Long before the internet was created and laid claim to the term, restaurants and bars were the places where most social gatherings occurred; and they continue to be the places where real life experiences play out for us all. These experiences in many of our favorite (and not-so-favorite) hangouts are a reflection of what we used to be and who we’ve now become—a symbol of the things we truly value; because in restaurants and bars, people actually sit down across the table from one another and share thoughts, dreams, fears, and secrets. We hope this practice continues for many more years to come. Restaurants and bars mean so much more to us than just providing convenient and affordable access to our daily sustenance. Did you know that nine out of ten restaurants and bars nationwide participate in charitable activities that help support the local communities that they do business in? Each year, restaurants provide an estimated $3 billion in charitable contributions. Ninety-two-percent of Americans say they enjoy going to restaurants—confirming that dining in a restaurant is one of America’s favorite pastimes— impacting nearly every man, woman, and child in the country. There are few people in America who do not have at least one family member, acquaintance, or loved one who works in a restaurant or bar. There’s no escaping it; it is clear that restaurants and bars impact us all and in ways that you probably neverthought about before now. It is worth reiterating, restaurants are an American institution like no other; the restaurant industry impacts us all in ways that no other industry has, does, or possibly ever will. Whether it is fast food or fine dining, casual or convenient, a bit extravagant or downright “down-home,” the restaurants in which we choose to spend our meal occasions are deeply personal—after all, not only are we putting food and drink that is prepared by restaurants into our bodies, we are also creating special moments that will be forever a part of our memories. Perhaps, you can recall when and where restaurants played a critical role in your life? The local diner where you scored your first kiss? Maybe the place where “Mr. Right” popped the question or where “Ms. Right” accepted? Or maybe the pizza place where your son or daughter wildly celebrated a birthday or a school award? Or the coffee shop where you enjoyed the last long chat with your uncle who taught you how to fish or with the aunt who listened to your most personal dreams and fears? Maybe you will recall the fast food place with the perfect French fries or the little bistro where you asked your best friend to be your maid of honor? Maybe you will remember the steakhouse where you got your first job or the franchised restaurant where you had been given the opportunity to build a career that eventually allowed you to purchase your family’s first home? These are the real moments that truly make a lasting impression on each and every one of our lives and the lives of those nearest and dearest to our hearts. It is these moments that we spend in restaurants that we laugh and smile, listen and cry, love and live, and work and grow. Restaurants are spread all throughout the world, but nowhere can one find the diversity, excellence, and convenience provided by restaurants here within these United States. Just like American families, restaurants come in all shapes, styles, and sizes; and each and every one of them play a critically important role in the overall picture of our society. We can experience a wide range of service styles, from fine dining to quick casual, from casual dining to fast food, and everything in between. We can savor the absolute best cuisines, like French, Italian, Japanese, Greek, Chinese, Indian, American, and Mexican; the list goes on. We can savor the best flavor profiles, such as the best burgers and fries; the best pizzas and pasta; the best chicken, steak, seafood, and pork entrees; and the absolute widest varieties of appetizers, salads, desserts, and beverages. America offers the fastest, the most convenient, the most affordable, and the most outstanding restaurants in the world. As a society, Americans have had a longstanding love affair with restaurants that has lasted for many, many years; and nowadays, with such highly visible celebrity chefs, cooking contests, restaurant reviews, and restaurant television and food networks, restaurants are more popular than ever before. It is all of the aforementioned reasons that lead us to this one simple statement: Restaurants are critically important to the American workforce, the American way of life, and to all of America. As restaurant industry employers, employees, and vendors, we must do our absolute best, individually and collectively, to make restaurants as safe and secure as reasonably possible for everyone. That is the entire mission of Restaurant OSHA Safety and Security. We all have duties and responsibilities, but did you know that the term duty is actually a legal term and virtually every restaurant employer and employee is required by law to comply with OSHA’s General Duty Clause? It is not an option. Make no mistake about it, if an incident occurs on your premises or under your watch that leads to someone (an employee, customer, vendor, or other) getting injured, harmed, sickened, maimed, or killed, the OSHA General Duty Clause will most likely become a significant arguing point between the lawyers involved in the case (you can pretty much bet there will be a “case”). You can rest assured that they will challenge you about this and all kinds of other duties, roles, and responsibilities. But if you understand how OSHA’s General Duty Clause applies to these types of incidents, it will help you to understand how many of OSHA’s other standards also impact your duties, roles, and responsibilities and how ultimately they may impact your business. One significant duty that we all have to abide by is that we must operate within the laws of the land; and, needless to say, one of those laws is the OSH Act and its General Duty Clause. This Clause plays a significant role in the safety and health of all industries, including the restaurant industry. Surely, we can all agree that regardless of where it exists or what industry it falls within, the workplace should always be as safe, healthy, and secure as reasonably and humanly possible. In fact, creating and maintaining an environment that is anything to the contrary would be ill-advised and inherently dangerous. Mr. Perez hit the nail on the head. But OSHA and the General Duty Clause of OSHA are about so much more than merely providing safe working conditions for working people—especially as it applies to an industry like ours where the customers we serve and the vendors we do business with and countless others share the same space that is used by the restaurant employees while they are performing their job duties. OSHA is about providing safe, healthy, and secure premises and safe, healthy, and secure conditions for people—all people who enter the worksite or workspace where and while employees are working. OSHA has the authority to put into effect standards that prescribe the methods employers are legally required to follow to protect their workers from hazards. However, just because a particular hazard or dangerous condition is not specifically referenced in an OSHA Standard does not mean that an employer is not legally required to implement an industry standard or a site-specific standard (or even just plain old common sense) in order to remove a hazard or a dangerous condition in which someone—anyone—could become injured, harmed, sickened, maimed, or killed. In fact, it is quite to the contrary. If a hazard or dangerous condition exists, it must be blocked off, eliminated, reduced, or removed by restaurant management immediately. What If No Specific OSHA Standard Exists? The General Duty Clause “is generally cited when no OSHA standard applies to the hazard.”10 In other words, a safety, health, or security hazard, even if not specifically referenced by OSHA, may fall under the General Duty Clause. This Clause is important because it is impossible to conceive of every single potential hazard or dangerous condition that could ever exist and turn each one of them into an OSHA standard. It is imperative that employers recognize that their responsibilities reach far beyond just the specific hazards that have been identified (specifically provided in its codes) by OSHA. it in the first place. It comes down to whether it was reasonable and customary for you or someone on your staff to recognize it as a dangerous condition or potential hazard. If an owner, manager, executive, or anyone else designated to be in charge is not willing to do an incident report and is not willing to do an incident investigation when someone has been injured, harmed, sickened, maimed, or killed, the next reasonable step would be to question whether or not he or she was properly trained, is incompetent, or just simply doesn’t care about people (and your business). After all, the restaurant industry is supposed to be the “hospitality” business; and anyone who doesn’t seemingly care about the safety, health, and security of others may be best advised to find another line of work. Let us leave that for another time and another place. For our purposes, a duty of care for a restaurant owner and restaurant establishment is, basically, the legal responsibility of a restaurant owner and a restaurant establishment to protect their employees, customers, and others. This is why premises liability insurance and many other forms of insurance exist. This legal responsibility is carried out by a particular standard of conduct by those who own, operate, manage, oversee, and work in restaurants at both the unit and the corporate levels. The duties of care are constantly being defined and redefined by case law and other incidents and events that lead to additional or differing duties and other policies, procedures, and standards created and implemented by those conducting business throughout the industry. In reality, these duties (and the way they are interpreted) will lead to countless arguments between opposing lawyers in front of judges and juries—if the matters get to that point in thelegal process. and, per, restaurant industry standard, to ensure that the chairs and barstools that customers sit upon have been maintained in a safe, healthy, and secure manner—which allows them to be used for their intended purpose(s) and, hopefully, without incident. So imagine the surprise when a customer severs a finger or two from his or her hand between the seat and the frame of the dining room chair when he or she sits down. We were once shocked to hear of incidents of this nature as well, until they became far too commonplace. That is just one of many examples of a hazard or dangerous condition that OSHA does not provide a specific standard for, but of which those doing business across the restaurant industry should be well aware. Until next time. Kindest regards and God bless.